Missing person: Everyday 1000’s of people are missing worldwide. I can help you to trace or locate missing person. I will do my best to help you. No obligations!! Make sure you give information such as person last seen or found, enquire the neighborhood and contact authorities if appropriate. Contact me asap, so that I can do an analysis, before situation goes out of hand. No obligations!! So the possible situations can be safe, alive, dead, mugged, robbed, captive, mobile not reachable and more. Most of them do come back on their own. Some people just disappear like that, and cut all the possible communications. Most probably safe. But this situation need not be true, most of the times. Missing person cases are very common. I could see lot of cases posted on social media like facebook and twitter. On average 1000s of people go missing worldwide on daily basis. The figure is much more. The guardians or loved ones are very desperate during such situations. They invest lot of money on flyers, newspapers, agencies, law authorities and more and what not. 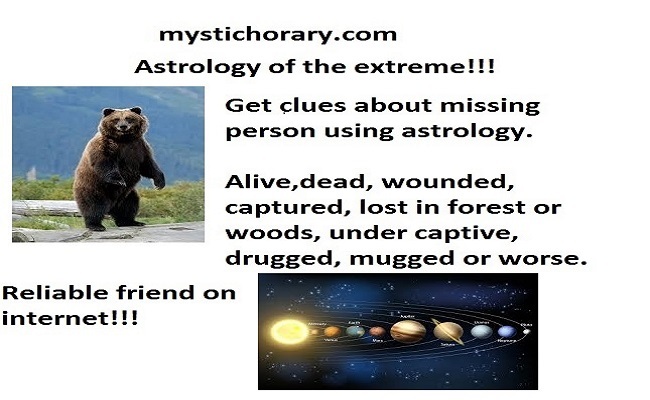 My astrology art, can give an insight of the situation and guides you, what can be done during such tough situations. (stressful situations) Most of the times, the person in question will do come back soon, without any afflictions. But its good to analyse the same. Sometimes the missing person can be found, after lot of efforts in searching, like lost in the woods during hikes or worse. Whatever, I can give insights about the situation, if you can contact me soon, before it is too late. Share this on all social media, whatsapp and other platforms. Thanks. 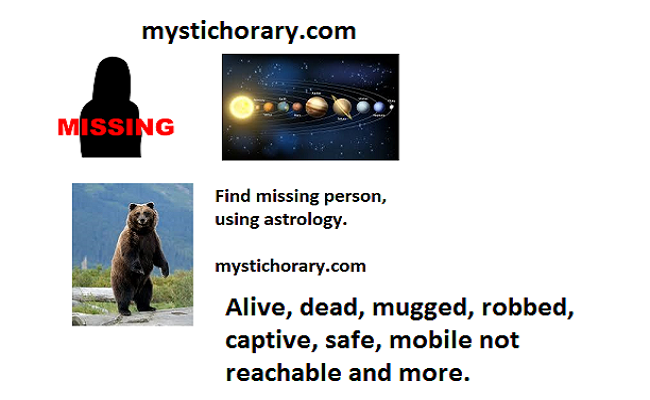 A small description about the person, the city/state/country, where he/she is last seen, did you make any enquiries/searches or contacting me, as soon as you lost contact with them. Did you approach law authorities or not? A photo of the person, will be ideal. (optional). This will help my spirits, to easily detect the person and sync with their energies.